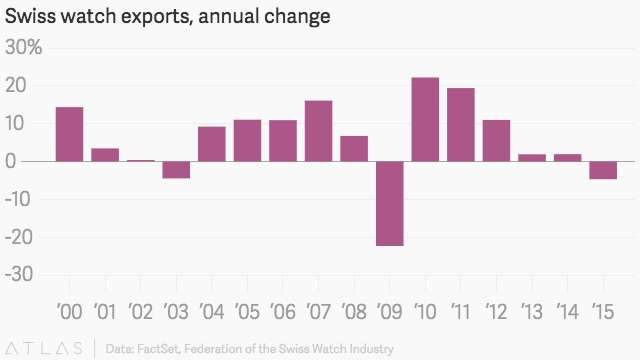 Swiss watches saw their first year of declining sales abroad (pdf) since 2009, with exports shrinking more than 3.3% in 2015 from a year earlier to CHF 21.5 billion ($21.1 billion). Bloomberg blames everything from slumping Hong Kong tourism to China’s corruption crackdown to the Apple Watch for the woeful state of the Swiss watch industry. 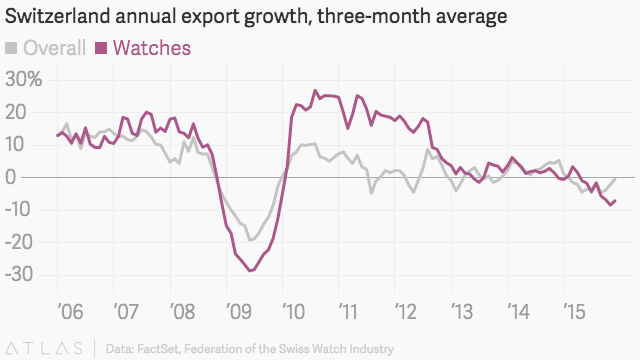 But zoom in, and you’ll see that Swiss exports—watches included—have been declining for months. As we noted in November, the issue with watches is just a symptom of a larger problem related to slowing global trade. 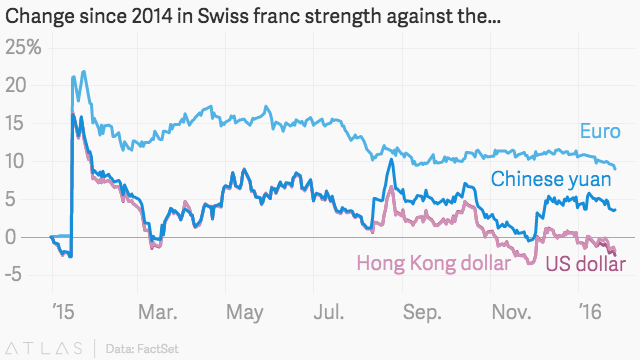 Part of that problem, as MarketWatch alludes to, is the strength of the Swiss franc. After the Swiss National Bank de-pegged the franc from the euro in early 2015, it shot up like a rocket, making its products more expensive abroad. Though the franc eventually reversed its gains against the currencies of its two largest export markets, Hong Kong and the US, it’s still stronger against the Chinese yuan and the euro, two other major destinations. And though Chinese exports rose 5.5% in December from the same time last year, it’s probably more worrisome that Hong Kong and US orders (which together make up 23.6% of all watch exports) fell 21.1% and 5.5%, respectively.